The texture we introduced on the T400s was inspired by several things. One of them was the innovative yellow paving blocks used in Japanese train stations and sidewalks to guide or warn visually impaired pedestrians. Every time I visit Japan I am intrigued by these blocks. The square Tenji block system was invented in Japan by Seiichi Miyake in 1965 and first used in Okayama City in 1967. The oblong raised pattern indicate places, and in what direction, it is safe to walk confidently. The “warning” blocks with the round raised dots indicate edges, corners or other places where greater care or caution is required. The tactile cues developed for these unique blocks help everyone stay clear of train platform edges, crosswalk dropoffs, and other related hazzards. Sighted or not, it’s really quite amazing how well these blocks work. You can easily discern the difference without looking. 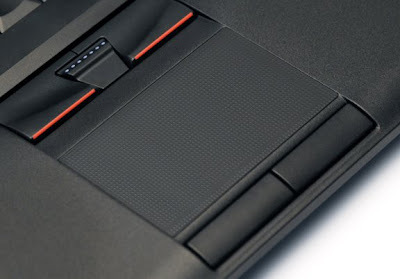 David Hill of Lenovo recently blogged at Design Matters about the design process in updating the touchpad design of the recently launched ThinkPad T400s. The textures of the touchpad used is based on the block system used to aid visually impaired pedestrians, which was first innovated in Japan but has since spread to other countries like the UK where tactile pavement warning surfaces are now very common. It is a brilliant post that I recommend fans of ThinkPads to read, even if you are like me and has no interest in using touchpads, if only to marvel at the attention to detail the design and engineering team at Lenovo continues to give when it comes to making the best notebook range in the world.